Who says you have to buy a seat with cup holders for your home theater?? 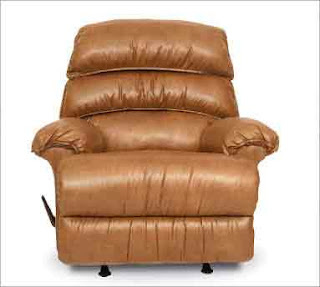 Regular recliners work just as well and Berkline is a great choice for recliners too. Berkline does it again with this gorgeous, comfortable WallAway Recliner. In two neutral fabric choices (Gunslinger light and dark browm) that highlight the plush styling, this is an easy choice. With generous padding in its chaise lounge design, a waterfall style seat back and pillow-style arms, you’ll feel at ease in this plush recliner, whether upright or reclined, with comfortable extra-cushiony support for your legs, arms and back. Innovative features include Berkline’s patented WallAway design that allows fully reclining within just inches of a wall, and a handle-activated motion that allows easy rising of the footrest. Features also include a removable back for moving the unit from room to room or within your home. Along with the neutral tone, the many choices you have when interior designing are enhanced by the WallAway design. Put it in the center of the room, or against a wall, allowing for unobtrusive design and a stylish room.